Case Abstract Submission for the 2019 Annual Meeting is now closed. If you missed your chance to submit a case for our 2019 AMSSM Annual Meeting we encourage you to consider submitting your abstract in the Fall of 2019 for the 2020 AMSSM Annual Meeting. The deadline for Case Abstract submissions will be the second Tuesday in November. For 2020 that date is MORNING of November 12, 2019, at 11:00am Central Time. AMSSM is pleased to announce that we will continue with the increased number of oral case presentations at the Annual Meeting in 2019. The top Cases will be presented during six concurrent oral case presentation sessions. The case posters will remain the same format as previous years with two poster presentation sessions. Each AMSSM member will be allowed to submit ONE case abstract for the Annual Meeting that they are the primary author/presenter(multiple research abstract submissions are still allowed). There is no limit on the number of submitted abstracts that you can be listed as a co-author. PRIMARY AUTHOR/PRESENTER: The primary author is required to be an AMSSM member at time of submission. Student Members can submit an abstract but must have a senior author listed that is a full active AMSSM member. The primary author submitting the case must be the presenter and intimately involved with the case. Presenter substitutions will only be allowed for significant changes in life circumstance and will require the written approval of the Education Committee Chair(s). PREVIOUS PUBLICATIONS: The abstract must not have been published as an abstract or as a full paper in a scientific, medical or professional publication prior to presentation at the AMSSM Annual Meeting. COMPLETE CASES ONLY: The case must be completed at the time of submission. Cases that are waiting for results, incomplete or pending will be rejected. WORD LIMIT: The maximum length of the abstract is limited to the number of characters allowed for each text field (NOT including Title, Author(s), Affiliation and Headings). TOPICS: Cases of particular interest include controversial cases, common problems with uncommon presentation, uncommon problems with common presentation, or illustrative cases of common problems. The abstract should identify the history, physical exam and 5 differential diagnosis. The abstract should outline the Tests & Results (Lab, X-ray, etc. ), Final Diagnosis, Discussion as well as the Outcome of the Case including Return to Activity and Further Follow-up of the case to be discussed. ABSTRACT REVIEW: Abstracts will receive a blind review. There are some helpful tips when writing listed below. You will be notified of the acceptance/rejection of your abstract in February 2019. If you have any questions, please contact the AMSSM National Office. The AMSSM membership enjoys lively discussion regarding the presentation and work-up of interesting cases. These are some tips that can enhance the quality of your write up and ensure a successful case presentation at the AMSSM Annual Meeting. In choosing to submit a case for consideration for presentation, you should be prepared to defend your workup and your management decisions, particularly if you are presenting new or controversial management protocols. Constructive criticism from both the panel and the floor are expected. Criticism should not be taken as a personal affront by the presenter. While the presenter is discouraged from lecturing on the topic; he/she is expected to have attained a reasonable degree of expertise through the clinical care provided and the research performed in preparation of the presentation; therefore he/she is encouraged to answer questions from the panel/audience and actively participate in the discussion. Check your grammar and spelling carefully, as this may affect your review. Follow the space guidelines. In general, the fewer words you can use to write the case, the better. Leave spaces to make your case readable, which may increase the likelihood of a positive review. Allow the case to “unfold” as it did when the case first presented to you. Be sure to include up to five separate differential diagnoses. DO NOT include your final working diagnosis in the title! Diagnosis in the title may exclude your case from evaluation and/or lead to alteration of the title. Cases of particular interest include: controversial cases, common problems with uncommon presentation, uncommon problems with common presentation, or illustrative cases of common problems. The abstract should identify the history, physical exam, five differential diagnoses. The abstract should outline the Tests & Results (Lab, X-ray, etc. ), Final Working Diagnosis, Discussion, Outcome and Return to Activity/Follow-up. Abstracts will receive a blind review. There are some helpful tips when writing, submitting and presenting your case abstract on the main abstract submission page. You will be notified of the acceptance/rejection of your abstract in February 2018. Case history, initial physical exam, panel questions (4 minutes). Labs, x-rays, course of treatment, return to play, panel comments (4 minutes). Comments from the audience (2 minutes). Time your presentation carefully. If you should exceed the allotted time for any section, the chair will stop you mid-presentation. Case presentations are a framework for discussion, and presenters are strongly discouraged from lecturing on their topic. Include one slide at most, designed to cover teaching points, only if the diagnosis is unusual. It is expected that should the presenter begin to lecture on the topic, the chair will intervene and continue the discussion in a more informal manner. Research Abstract Submission is now closed. The deadline for submissions is the first Tuesday in December. You must be an AMSSM member to submit an abstract. Student Members can submit an abstract but must have a senior author listed that is a full member. You may submit more than one research abstract. However, each first author/presenter will only be permitted to give one podium presentation. If additional abstracts are accepted, they will be poster presentations. The primary author submitting the abstract must also be the presenter. Presenter substitutions will only be allowed for significant changes in life circumstance and will require the written approval of the Research Committee Chair(s). You CANNOT submit the same Research Abstract for the a Case Presentation session. Abstracts which have been presented elsewhere will be accepted. However, this work must not be submitted for publication as a full paper in a journal at the time of abstract submission or have appeared in print elsewhere (except in abstract from) prior to the AMSSM Annual Meeting. Please review the complete list of submission requirements on the submission form. There is a maximum character count per section. For an example of the abstract form and the number of characters allowed per section, please view the example here. Greater than and less than symbols (>, <) must be separated by a space and typed directly into the form. Plus/Minus signs (±) are not an accepted entity for html when inserted into your form or copied from a WORD or Pages document. Please use +/- typed directly into the form to ensure proper submission. If you are planning your abstract submission and are unfamiliar with the format of the submission form and the requirements, you can CLICK HERE to view a blank submission form. This copy of the submission form cannot be used to submit an abstract. Immediately following the completion of your abstract submission you will be sent TWO emails, from Michele Lane confirming your abstract was transmitted. FIRST EMAIL: If you do not get receive this confirmation email within one hour of your submission, it is your responsibility to email Michele Lane by 2:00pm on December 5, 2018 to ensure your abstract was transmitted. This confirmation is generated automatically. SECOND EMAIL: Will contain the information you submitted on your abstract form. Then on December 5, 2018, after 5:00pm a final email will be sent to confirm successful submission into our database. If you do not receive all THREE emails, you are responsible for emailing Michele Lane no later than 2:00pm Central Time on December 6, 2018 to check on your submission. Please be sure your email address is correct in our database before you begin your submission to ensure you receive these confirmations. Podium presentations for the top 24 research abstracts will be presented during one concurrent two-hour session. Two winners will be selected from the concurrent sessions. In addition, we are add four one-hour Rising with Research sessions each morning. 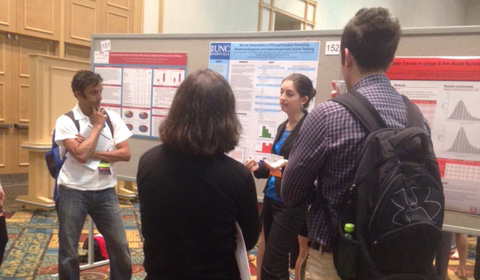 The oral research poster presentations will remain the same format as previously with one oral poster session. If your research is chosen as an oral poster presentation, bulletin boards will be provided for you to mat your poster materials. The size of the board is 3.5' x 3.5' OR 42" x 42".